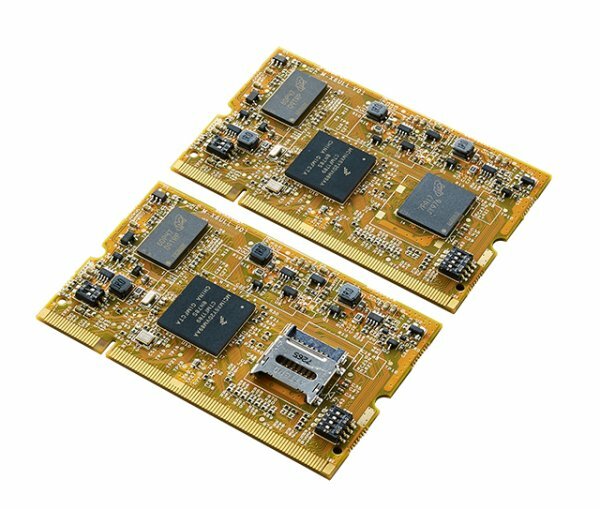 Artila Electronics, a professional in development and manufacture of ARM-based embedded Linux systems, has released a SODIMM module M-X6ULL based on NXP i.MX6ULL processor family. The new M-X6ULL is designed to meet the needs of many general embedded applications that require power efficient, high performance and cost optimized solution, as well as embedded systems that require high-end multimedia applications in a small form factor. The i.MX 6ULL is a power efficient and cost-optimized processor family featuring an advanced implementation of a single Arm® Cortex®-A7 core, that can operate at speeds up to 900 MHz. The i.MX 6ULL application processor includes an integrated power management module that reduces the complexity of an external power supply and simplifies power sequencing. Each processor in this family provides various memory interfaces, including 16-bit LPDDR2, DDR3, DDR3L, raw and managed NAND flash, NOR flash, eMMC, Quad SPI and a wide range of other interfaces for connecting peripherals such as WLAN, Bluetooth®, GPS, displays and camera sensors. The Artila NXP i.MX 6ULL is clocked up to 800MHz and is Linux ready. The module is notable for offering Linux 4.14 with the PREEMPT_RT real-time patch which could make the module find applications in areas that needs real-time interaction. The SODIMM styled ultra-compact module measures only 68 x 42mm. The module provides support for interfaces like CAN, UART, USB, SD, LCD, GPIO, SD, Ethernet, and some others which are accessible through the module’s 200-pin expansion connector. The module ships with 512MB of DDR4 RAM, a 4GB onboard eMMC, and a 16MB NOR flash. It provides one 24bits digital parallel display interface that supports max 85MHz display clock and up to WXGA (1366 x 768) at 60Hz, a touch controller that can support 4-wire and 5-wire resistive touch panel. The module is 5V rated and consumes about 0.75 Watts.